Ce document au format PDF 1.3 a été généré par Adobe InDesign CS5 (7.0.4) / Adobe PDF Library 9.9, et a été envoyé sur fichier-pdf.fr le 18/01/2016 à 12:57, depuis l'adresse IP 105.235.x.x. La présente page de téléchargement du fichier a été vue 504 fois. Taille du document: 14.9 Mo (16 pages). touch to contemporary architecture. Made by Novoferm. design sophistication. We know that architects and property owners want a broadly diversified programme, especially in property construction, that features individual elements with matching designs. technical specifications for the individual models, on the following pages. anchored to the centre of the profile. This produces a uniform visible width of 150 mm for all models. has been added to the range. design? Then our solutions are the perfect answer. will: two factors that are particularly welcomed in sophisticated property construction. offers users maximum scope for design. space free on each side which can be used, e.g., for cable routing or for fastening add-on parts. than 500 mm. The elements are pre-assembled for bushing assembly or weld-on fitting. aluminium, stainless steel or plastic. The inactive leaf is fixed by a rebate retracting bolt at the top. An anti-panic function that complies with EN 179 or EN 1125 is also possible as an alternative. available instead of screw-on hinges on request. Anodized, stainless steel finish, or powder coated (RAL Classic of choice). “Unico” is fitted with innovative thermal separation made of stainless steel which permits a particularly narrow visible width. anti-panic functions in accordance with EN 179 or EN 1125 can be integrated. these systems. That is quality made by Novoferm. width of frame and leaf: 130 mm, pedestal height: 50, 70-420 mm, installation depth: 50 mm. The inactive leaf on a double door unit must not be less than 500 mm. The elements are preassembled for bushing assembly or weld-on fitting. aluminium, stainless steel or plastic. The inactive leaf is fixed by the upper latch on the active leaf. or integrated hinges, are possible. Outer frame dimension Width min. – max. Installation of the RS-1 or RS-2 door in the fixed glazing: We recommend a stiffening tube on the left and right of the frame profile of the fixed glazing. 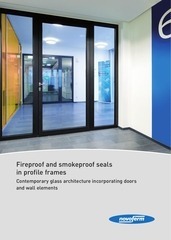 Installation of the T30-1 (EI 30) or T30-2 (EI 30) door in the F30 (EI 30) fire-resistant glazing: Stiffening tube on the left and right of the frame profile of the fixed glazing. Installation of the T90-1 (EI 90) or T90-2 (EI 90) door in the F90 fire-resistant glazing: Stiffening tube on the left and right of the frame profile of the fixed glazing. always able to deal with you – wherever you are! Ce fichier a été mis en ligne par un utilisateur du site. Identifiant unique du document: 00393807.